SINGAPORE - Singapore Post Centre (SPC) will be redeveloped into the first retail mall here to combine brick-and-mortar shops and online shopping - all under one roof. The new mall will revolutionise retail concepts for consumers and retailers alike, Singapore Post announced on Wednesday (Oct 28). For instance, a consumer could browse in-store, purchase the product and arrange for delivery of the product directly to their home. The consumer could then continue shopping, watch a movie or have a meal in the mall without having to carry bulky shopping bags. The retailer, on the other hand, could save on storage space in the store as fulfilment would be done at the backend of the warehouse. Said SingPost chairman Lim Ho Kee: "Ever since our IPO in 2003, SingPost has always sought to maximise the returns to our shareholders by realising the full potential of our assets - from human capital to physical assets and resources." "The redevelopment of the retail mall at SPC is part of our efforts to extract maximum value from our property portfolio and support our accelerated transformation from Singapore mail to global eCommerce logistics." The new retail mall is scheduled to be completed around mid-2017 and will be at the present open concourse in front of the SPC, located next to Paya Lebar MRT station. It will boast 25,000 square metres of retail space. A groundbreaking ceremony is scheduled for Wednesday morning to mark the commencement of the project's construction, whose cost is estimated at $150 million. This includes upgrading amenities and façade for the adjoining office building. Said Dr Wolfgang Baier, group chief executive officer of SingPost: "SingPost is building a unique and disruptive concept - converging online and offline - to gain maximum customer benefits. 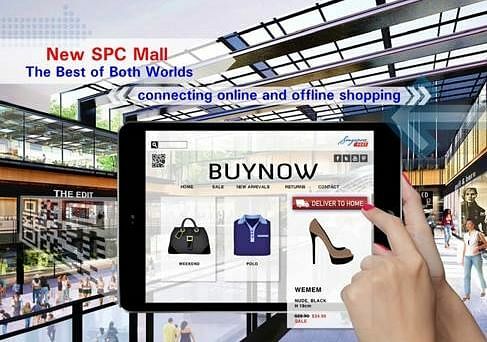 With the new retail mall at SPC, consumers can enjoy the best of both worlds - online and offline - while businesses can potentially cut costs and focus on enhancing customer experiences." "This is an important shift in mindsets as well as the retail and eCommerce landscapes. The convergence of online and offline will bring exponential benefits to consumers and businesses - therefore we view this as 'O²' (O-squared) instead of O2O (Online-to-Offline). The SPC O² retail concept puts consumers at the heart of this evolution, allowing them to have greater retail options and more convenience." The new retail mall at SPC will consist of four above ground levels and one basement, an eight-hall Golden Village cineplex, SingPost's flagship post office, retail shops, Kopitiam food court as well as other food and beverage outlets. Under the Urban Redevelopment Authority masterplan 2008, the area around the Paya Lebar MRT station will be developed into a suburban commercial node, while retaining its cultural identity. The new retail mall at SPC will reinforce the plan and add more buzz into the area by introducing the new O² retail experience, said SingPost.